According to the report produced by the IMF, the growth in India’s export to the countries of Africa has grown more than 100% in the last few years. After the crisis of 2008, the export from India to Africa has taken a completely new dimension and rising with every passing quarter and the years. Though China is still the main exporter for Africa India is also just behind it. 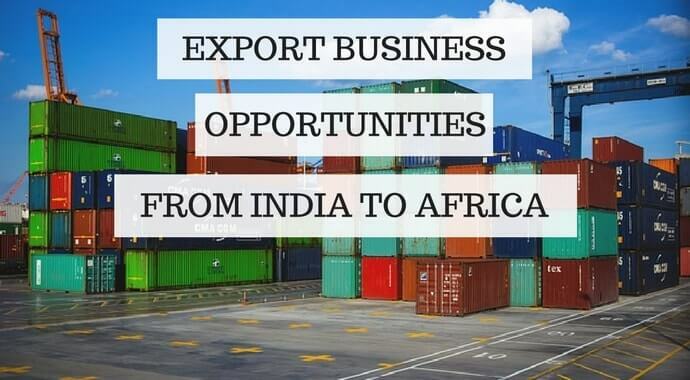 Talking about this phenomenal growth in the export of India’s goods to Africa has opened doors for various new and already established manufacturers and producers and the suppliers. What India Exports to Africa? Once we used to export only the agricultural products to Africa but now with the passage of time we are one of the most important suppliers of their consumer goods and also automobiles and others. Almost 60% of the export from India to Africa is constituted of consumers goods and this can help you in gauging the profit margin you can earn if you start exporting these goods to this continent. There is a huge list of consumer durables products which you can export to the African countries and grow your business and earnings. Most of the electronic goods are high in demand in Africa for last few years with their growth in the economy and individual household. The growth of Chinese economy has been sluggish for the last year which is opening up more opportunities for the Indian exporters especially in the Middle East and African countries. The consumer durable products are high in demand both in Indian and African markets which can definitely a big scope and hidden opportunities are there in this scenario. If you want to set up a manufacturing unit, you would need a huge capital investment. So before you do that, you need to source clients who will be interested in the products. Having a structured business plan is a prerequisite to starting this kind of a business. Another big opportunity in the export business with Africa, India can bid in pharmaceuticals. In the recent years, India has already gained the position of the world leader in the manufacturing of the generic goods and Africa been affected by various diseases and health issues, has to potential of being the most important consumer of such medicine. Almost $15 million has been already reaped by India, exporting generic medicines to such countries. If you are well aware of the pharmaceutical industry, you can too be a part of this huge profit as well as a social development. The generic goods cost a fraction of the main medicines but can serve well for the betterment of the health. You can supply medicines for HIV, Malaria, Diarrhea and other diseases as well as Africa are mostly affected by these. The profit margin is not very high but taking into consideration the fact that these drugs are widely used in the African continent, the profit amount can go up with increasing sales. India is one of the most affluent countries in agricultural products especially in the rice and wheat production, Africa imports a large amount of rice from India. You can easily take part in the supply of the rice to Africa if you are looking for business opportunities in their land by means of export. India is amongst the very few countries from which Africa imports rice and taking this fact into consideration, there is a huge scope of development in this export business. Moreover, the capital required to set up a supply business of rice is not huge and you can reap profit within a short period of time. India exports mainly non-basmati rice to Africa, almost 3-3.5 million tons of non-basmati rice is exported to West African countries as well as the countries in the south of Africa from India every year. It amounts to the 5% of the total export of Africa whereas 100% of the broken rice is supplied from Indian soil. Keeping the above factors in mind, you can definitely gauge the opportunities you can reap if you start investing in the export business of the non-basmati rice to the land of Africa. Indian manufacturers and suppliers of automobiles export almost 20% of the requirement of Africa in the automobile sector. 20% of the automobile export is a huge opportunity for you to grow in this market. India is shifting its focus from consumer durables and agricultural products tot eh automobile export for African countries as there is a huge demand for it. Though this business calls out for huge investment at the beginning it has a huge opportunity as the African market is growing at a rapid pace and the demand is increasing every day. Not only the automobiles itself but also the parts that are the spares of the automobiles are high in demand in Africa and there is a big market as well for Indian entrepreneurs to explore. In last few years India exported automobiles amount to almost $700 million to Africa. With the new technology coming in the automobile industry, the numbers and figures are expected to increase over few years of time. India has always been a land for the manufacturing of Iron and steel products and Africa imports a good percentage of the same. There are various businesses you can do in this sector which you can export to Africa. You can start supplying iron and steel products to the continent and the profit is expected to be on the higher side providing their growth prospects. How can you start an Export business to Africa? You need to obtain Importer- Exporter Code number which is mandatory for setting up an export business firm. Apply on DGFT site and you need to use your pan number for the same. You need to acquire the registration and membership certificate from the Export Promotion Council or FIEO and other authorities. You need to understand the whole procedure of the customs and the excise duty before you start the export business from your country. The excise duties and the customs fees vary according to good and you need to pay accordingly. You need to obtain the BIN which is the Business identification number from the customs department for filling the shipping, etc.